***Toyota Tacoma SR5 Double Cab V6 4WD*** Auto, 5' Bed, Alloys, Camera, Tonneau, Towing & more!! 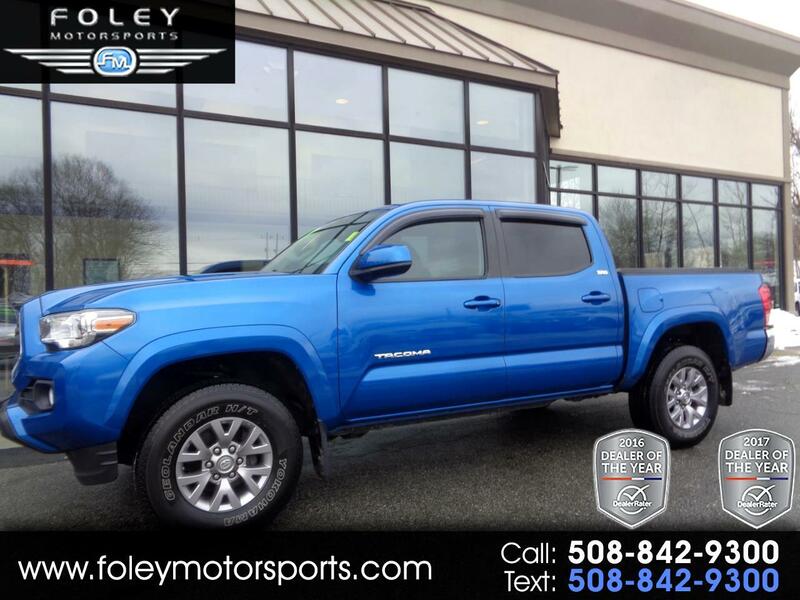 2017 Toyota Tacoma SR5 V6 Double Cab 4WD... Blazing Blue Pearl on Gray Interior... 278hp 3.5L V6 Engine... 5' BED w Tonneau... Towing ... 6,800 lb Towing Capacity... Toyota factory Powertrain Warranty Coverage... Only 52,261 Miles!! Well Equipped with Alloy Wheels... Remote Keyless Entry...Cruise Control Leather Wrapped Steering Wheel... Sliding Rear Window... Privacy Glass... Enhanced Entune Audio System Supports Satellite Radio... Smartphone-enabled Navigation via the Scout GPS App and Siri Eyes Free Voice Control... Backup Camera... Bluetooth w USB interface... Towing... Tonneau Cover and much more!! Please feel free to contact our experienced sales team with ANY questions or to schedule a test drive. Buy with confidence from the area LEADER in Pre-Owned LUXURY. Additional 5 Year/100K Extended Warranty Coverage Available. ALL of our vehicles are meticulously detailed and serviced by our factory trained certified technicians. Call or email us at sales@rjfoley.com **$0 Down** 100% financing available with great rates! Trades are always welcome. National and International shipping quotes are available.